At Times Beach, Missouri dioxin was spayed over a town and horse farms and Reagan’s emasculated EPA tried to ignore the impact on the people who lived in the town and on the horse farms. The people fought back and EPA had to reform itself. Here is that story. After the interstate highway system was constructed, beginning in the 1960s, Route 66 became obsolete and largely disappeared, physically as well as symbolically. A superhighway replaced the last stretch of Route 66 in 1984. In September 1999, an attempt was made to reconstruct the myth of the road. 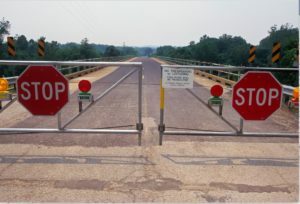 Route 66 State Park was opened along the Meramec River, twenty miles southwest of St. Louis. The park lies in the Meramec floodplain and covers 409 acres with hiking, biking, and horse trails, and wetlands that attract a broad range of birds, deer, and other game. There is a visitor center along with a small museum of Route 66 memorabilia. The park is unremarkable, except for a vast mound covered with grass that stands next to the picnic area. The mound, which seems oddly out of place in this landscape, is the grave of the town of Times Beach, Missouri–torn down, bulldozed, and buried. Under the grassy mound lie the remains of houses, mobile homes, and businesses, including the Easy Living Laundromat, the Western Lounge bar, the city hall, and the Full Gospel Tabernacle Church. It was not some mighty natural force that caused such devastation. Instead, it was a small-time waste hauler named Russell Bliss, in league with a company that was trying to save a few dollars on its waste disposal costs. In the late 1960s, the Northeastern Pharmaceutical and Chemical Company, Inc., or NEPACCO, set up business in a portion of a manufacturing facility near Verona, Missouri, west of Times Beach. The former operator and still owner of the site was Hoffman-Taff, a company that made the defoliant Agent Orange used by American forces in Vietnam. NEPACCO produced hexachlorophene, an antibacterial agent used in soaps, toothpaste, and hospital cleaners. NEPACCO first made trichlorophenol (TCP), and then further refined it to make hexachlorophene, the same product made at the ICMESA plant in Seveso, Italy. At the end of the distillation process, liquid residues, known as still bottoms, accumulated and were stored in a black 7,500-gallon tank. Disposal of the bottoms was expensive, and though NEPACCO at first paid an experienced waste company to dispose of the still-bottom residues by incineration at a facility in Louisiana, it later looked for ways to cut costs. When a sales representative at ICP, a local company that sold solvents, heard that NEPACCO was looking for a solution to its high-cost waste disposal problems, the company contracted with NEPACCO to dispose of the still bottoms. ICP knew little about waste disposal, however, and it in turn subcontracted the disposal to Russell Bliss. Bliss operated a waste oil business, collecting used crankcase oil from gas stations and reselling it to refineries, recyclers, and anyone else who would pay for it. ICP charged NEPACCO $3,000 per load and paid Bliss $125 per load. ICP knew the material was potentially hazardous but did not know what was in it. ICP sent a sample of the still-bottom residues to Bliss. He dipped a paper napkin in it, lit the napkin, and concluded that it seemed like a heavy grease. Bliss, or his workers, drained the NEPACCO waste into a tanker truck, and drove the tanker to his storage facility near Frontenac, Missouri. There the still bottoms were unloaded into storage tanks, which were also used to store used crankcase oil. Between February and October 1971, Bliss picked up six truckloads of still bottoms from NEPACCO, each load containing 3,000-3,500 gallons. In addition to operating a waste oil business, Bliss kept a stable of Appaloosa show horses. To keep the dust down, Bliss drained the mixture of crankcase oil and still bottoms from his storage tanks in Frontenac and sprayed the material around his horse farm. It worked so well that Bliss began to sell his dust-suppressant services to others, including Shenandoah Stable, near Moscow Mills, Missouri. The owners, Judy Piatt and Frank Hempel, who also kept Appaloosas, paid Bliss $150 to spray the floor of their indoor arena in May 1971. Bliss told Piatt that the material would kill all the flies around the horses. It did more than that. The night after the spraying, a horse grew quite ill. Within a few days, five more horses lost their hair, developed sores, and became severely emaciated. Sparrows, cardinals, and woodpeckers began to drop from the rafters of the barns. Before long the horses, too, began to die. Piatt blamed the deaths on the spraying, but Bliss denied responsibility, claiming that he had sprayed only used motor oil. To try to stem the flood of deaths, Piatt and Hampel removed a foot and a half of soil from around the arena, but to no avail. Eventually sixty-two horses died or had to be destroyed. Both Piatt and Hempel suffered diarrhea, headaches, and aching joints. Piatt’s six-year-old and ten-year-old daughters also became sick after playing on the floor of the arena. The younger daughter had to be rushed to the hospital on one occasion, and both suffered from gastrointestinal pains and inflamed and bleeding bladders. A young veterinarian, Dr. Patrick Phillips, who was a graduate student at the time, visited the Piatt stable but could not determine the cause of the illnesses or the deaths of the horses. Because of the unexplained deaths of the horses, and the illnesses of the children, the Missouri Division of Health alerted the federal Centers for Disease Control (CDC) in Atlanta, Georgia. In August 1971, the CDC inspected Shenandoah Stable and collected human and animal blood samples, as well as samples of the soil. CDC representatives also spoke with Bliss, who assured them that he had sprayed his own stable with the same material and that he had not experienced any problems. Piatt and Hempel took matters into their own hands. In September 1971, they sued Bliss for the injuries and loss of the horses. Starting in late 1971, they also surreptitiously followed Bliss’s trucks as waste materials were sprayed or dumped around Missouri. Hempel sometimes wore a wig, Piatt wore a large cowboy hat, and they borrowed different cars to disguise themselves, but Bliss’s drivers often recognized them. Piatt and Hempel kept a record of where Bliss sprayed or disposed of materials, keeping up the surveillance for fifteen months. While Piatt and Hempel followed Bliss, the CDC attempted to identify what might be in the waste oil that could cause such toxic reactions. By late 1972, they were still unable to identify the chemical culprit. Around this time, Dr. Phillips and Piatt heard about the Timberline Stable, where similar problems had occurred, including the loss of twelve horses. The son of the stable owner also contracted a severe skin disorder, chloracne, after playing in the stable. A colleague of Dr. Phillips took samples at Timberline and suffered a burn and then blistering of his face from the soil sample. The CDC was again notified. In late 1973 and early 1974, the CDC analyzed more soil samples from Shenandoah Stable, and this time the agency found traces of trichlorophenol (TCP), an ingredient in herbicides that causes blistering. When the trace amounts of TCP were administered to the ears of rabbits, they developed the signs of blistering, as expected with TCP. What was not expected was that several of the rabbits died, and autopsies revealed liver damage. This reaction could not be attributed to such small doses of TCP. Something much more deadly was at work. The CDC ran more complicated tests and discovered that the soil contained tetrachlorodibenzo-p-dioxin (TCDD) or, more commonly, dioxin. In fact, the soil samples contained over 30,000 parts per billion (ppb) of dioxin. At this time, though dioxin was known to be deadly to animals, even in small doses, little was known about its effects on humans, and there was no standard for what constituted safe levels of dioxin. The CDC immediately notified the Missouri Division of Health. Dr. Phillips found Piatt and Hempel at a restaurant and told them the news. He explained what dioxin was, although he himself had only that day learned about it. None of them knew how dangerous dioxin was, only vaguely connecting it with Agent Orange and the Vietnam War. The authorities began to look for the source of the dioxin. The high concentration of the chemical indicated that it came from an industrial facility. Bliss stated that he got his oil from various sources in Missouri, none of which were industrial sources of dioxin. Dr. Phillips and CDC physicians discovered several facilities in Missouri, including the Hoffman-Taff facility, that could have made Agent Orange or TCP, but none seemed to have any connection with Bliss. Then the investigators located a former supervisor at the Verona plant, who informed them that Bliss had indeed hauled waste from NEPACCO. When they confronted Bliss about the waste hauling he did for NEPACCO, he claimed that he had just remembered the site and was about to call the CDC. NEPACCO went out of business in 1972, after its main product, hexachlorophene, was banned for most purposes by the Food and Drug Administration (FDA). The ban followed the deaths of thirty-six infants in France who were exposed to high levels of the chemical in talcum powder. Dioxin is an unwanted byproduct of trichlorophenol, a constituent of hexachlorophene. When the CDC inspected the Verona plant site, NEPACCO was gone, but the tank used to store still bottoms was there, filled with 4,300 gallons of liquid. The CDC tested the material and found dioxin at 343,000 ppb. One CDC representative suggested that there was enough dioxin in the tank to kill everyone in the United States. State and federal authorities, including the Environmental Protection Agency (EPA), focused their efforts on securing and cleaning the Verona site, working with Syntex, the company that had purchased Hoffman-Taff and was responsible for the site. After securing the tank, the most pressing problem was the disposal of the dioxin-contaminated material. One method was to incinerate it, but Missouri did not have any hazardous waste incinerators, and neighboring states threatened to block any attempts to transport the dioxin across state lines. Disposal of the dioxin was delayed until a suitable facility was found. Dr. Phillips and the CDC investigators also identified another site where dioxin had been sprayed and where several homes were later built. Tests showed high levels of dioxin in the soil. While the CDC recommended that the site be excavated and the people moved, its report also indicated that the half-life of dioxin was one year. Based on the estimate that half of the dioxin would degrade naturally within a year, which was later found to be erroneous, Missouri officials decided to leave the soil intact and not to move anyone. In 1979, the investigations took another turn. An anonymous tip reported that NEPACCO had buried drums of chemicals on a farm near the Verona plant. Hundreds of drums were uncovered, and dioxin was found in the soil samples. As at the Verona plant site, the first priority was to secure the drums and prevent further discharges before determining how to dispose of the dioxin. A lack of financial and human resources and insufficient legal authority hindered authorities in their investigation. The federal Resource Conservation and Recovery Act (RCRA), which was designed to regulate the generation and disposal of hazardous waste, was passed in 1976, but the EPA was slow to enforce the requirements of the new law. Also, RCRA did not address problems associated with old, abandoned hazardous waste sites. The gap in the law was closed several years later through the passage of the federal Comprehensive Environmental Response, Compensation, and Liability Act, also known as the Superfund law. The Superfund law established a government fund for the investigation and cleanup of abandoned toxic waste sites, with strict liability provisions that allowed the government to recover the costs of the cleanups from the responsible parties. The law was based on the principle that those who threaten public health and the environment through the production and disposal of toxic wastes should be made to pay for the cleanup–the polluter pays principle. As tough as the law was when it passed in December 1980, it immediately ran into headstrong opposition from the newly elected Reagan administration. Reagan was unsympathetic to environmental issues and immediately set out to diminish the effectiveness of the federal EPA by cutting resources, delaying regulatory actions, and reducing enforcement. These efforts to undercut the EPA, and the Superfund program in particular, were carried out by Anne Gorsuch, the head of the EPA, and Rita Lavelle, the head of the hazardous waste division. Both Gorsuch and Lavelle joined the EPA from jobs in industries that had been regulated by the EPA. Gorsuch had a reputation from her days as a Colorado legislator as someone who was deeply opposed to federal energy and environmental policies. Many viewed Gorsuch and Lavelle as foxes sent to guard the chicken coop. The Reagan administration cut EPA funding by 17 percent, and Gorsuch abolished the enforcement office, dispersing the staff into other programs. Soon after Lavelle assumed control of the hazardous waste program, she met privately with industry representatives whose hazardous waste sites were being investigated by the EPA. The meetings led to claims that Lavelle was entering into sweetheart deals with companies to relieve them of the obligation to pay for the multimillion-dollar cleanup of these sites. When the Reagan administration refused to surrender EPA documents to Congress, it was seen as an attempt to hide such deals. There were also reports that the EPA was attempting to lower the standard for dioxin cleanups. This, and the reductions in staffing and resources mandated by Reagan, including laboratories needed to analyze samples, deepened the distrust of both the EPA and the Reagan administration felt by those trying to deal with the dioxin. After reviewing all of the available records, including Judy Piatt’s record of where Bliss had sprayed, an EPA field investigator named Daniel Harris identified numerous sites all over Missouri that might be subject to dioxin contamination. The public demanded that the EPA take action to protect those exposed. Rita Lavelle stated repeatedly that no emergency existed, and that since not enough was known about dioxin, more studies were needed before action could be taken. When asked why some of the sites were not fenced, she infamously retorted that fences merely encouraged children to climb over them. Many saw these arguments as attempts to delay the process, as a denial of the seriousness of the dioxin exposure, and as an unwillingness to spend the Superfund money that Congress had appropriated. The EPA’s handling of events in Missouri became an embarrassment in the fall of 1982 when an environmental organization, the Environmental Defense Fund, published a leaked EPA document that listed fourteen confirmed and forty-one suspected dioxin sites in Missouri, and reported that the EPA was going to clean up sites only if the level of dioxin exceeded 100 ppb, whereas the CDC was arguing for cleanups where the dioxin level was only 1 ppb. The town of Times Beach was included on the list. Piatt’s records indicated that Bliss’s trucks had sprayed his oil mixture on the dirt roads throughout the town. Bliss continued to spray Times Beach from 1972 through 1976. Since the town had the largest population of all the newly revealed sites, it received the most attention. Sampling began in late 1982. Residents in the town soon grew accustomed to people in white moon suits taking samples of the dirt on their streets. Sampling was completed on December 3, 1982, which was fortunate, because on the following day Times Beach suffered its worst flood in history when the Meramec River overflowed. Residents of the town were evacuated, and it was several days before they could return. Even then, no cars were allowed, and the town was accessible only on foot or by boat. No one under sixteen was permitted to return at that point, and residents were warned to get tetanus shots, not to smoke because of leaking propane tanks, and to obey a curfew. Many residents attended the town’s annual Christmas party at city hall, to celebrate the holiday and their safe return after the flood. At the dinner, the residents learned of the results of the samples taken by the EPA. They were shocked out of their holiday cheer. Dioxin had been found in the soil along roads and in backyards. The CDC advised that the people who had not yet returned because of the flood should stay away because of the dioxin, and that those who had returned should get out. Within days, police established roadblocks to prevent access to the town, and people in moon suits returned to take further samples. Times Beach quickly became Missouri’s Love Canal. Despite the growing crisis in Times Beach, officials at the EPA headquarters remained dismissive. Lavelle insisted that there was no emergency. Others closer to the Reagan White House saw Lavelle herself as a disaster in the making. In January 1983 control over events in Times Beach was taken out of her hands. Further tests conducted by the EPA indicated that dioxin was widespread throughout the town. Officials were uncertain about the health effects of exposure to low levels of dioxin in soil, and even more uncertain about how to dispose of it. The town was situated in a flood plain, and further flooding could spread the contamination. In the end, it was decided that buying the town would be more efficient than relocating the residents for an unknown period while the agencies figured out how to clean up and dispose of the dioxin. The decision to buy out the town was announced at a press conference on February 22, 1983, by the EPA administrator Anne Gorsuch. The announcement was made to a room full of reporters, while the residents of Times Beach listened to a loudspeaker outside. Within a few weeks, both Lavelle and Gorsuch were dismissed from the EPA for a variety of reasons, including their handling of Times Beach. Subsequently, in 1984, Lavelle was convicted of perjury before Congress, of obstructing a Congressional investigation, and of submitting a false statement. She spent four months in jail and served five years of probation. Meanwhile, the people of Times Beach were stranded. They had to decide whether to stay and wait for the buyout and assume the risks to themselves and their children, or to get out. The authorities had indicated that staying was not safe, but no one could tell them how dangerous it would be to stay. If they chose to leave their homes, they had to find alternative living accommodations and pay for both those accommodations and their Times Beach homes. Businesses in Times Beach were lost, as were the jobs at those businesses. Parents attended countless meetings trying to figure what to do, where to go, for how long, and how to get some financial assistance. Every cough, sore, and fever experienced by the children of Times Beach was watched intently by their parents, always fearing that this was just the first symptom of some unknown disease. Pregnant women worried deeply about the consequences for their babies. For five families that moved away, it was soon discovered that the mobile home park they had moved to was another site that had been contaminated by Bliss. They were forced to move yet again. The buyouts did not begin until August 1983 and ultimately cost more than $36 million, with the EPA paying 90 percent and the State of Missouri paying 10 percent of the costs. Based on the experience at Seveso, Italy, the state recommended that all the dioxin throughout Missouri be collected and stored in temporary facilities before being incinerated. Since Times Beach contained over 50 percent of the dioxin in the state, and no one would be living there, it was the logical choice for a new incinerator. Once built, it burned more than 265,000 tons of dioxin-contaminated material, including over 37,000 tons from Times Beach. Syntex was responsible for most of the cleanup at Times Beach and the other sites in Missouri, including the construction of the incinerator, the construction of levees to protect the incinerator and related facilities from flooding, and the demolition and burying of Times Beach itself. By 1997 the cleanup was complete. With the settlement of personal injuries, the costs were close to $200 million. Judy Piatt and her daughters eventually recovered on their claims against Bliss, IPC, and others. Bliss was prosecuted on a variety of charges, including illegal dumping and tax fraud, and was sentenced to a year in jail on the tax fraud conviction. People typically visit the Route 66 State Park to pay homage to the famous national highway and perhaps to learn some of its history. Little do they know that the vast mound next to the picnic area, like some prehistoric burial ground, contains the remnants of the lives of some 2,000 people, including their Christmas decorations, their beds, their swing sets, the roofs over their heads–all buried in this spot. “Times Beach, Missouri, 1982” from Robert Emmet Hernan, This Borrowed Earth: Lesson from the Fifteen Worst Environmental Disasters around the World (in English, Palgrave Macmillan, 2010; in Chinese, China Machine Press, 2011). Natasha Geiling, “Former chemical industry attorney takes over EPA’s Superfund task force,” ThinkProress (29 May 2018). NOTE: In 2004, Rita Lavelle was convicted on federal charges of one count of wire fraud and two counts of making false statements to the F.B.I. Lavelle committed these crimes in her personal business of environmental consultation.